The Abyss AB-1266 Phi edition planar-magnetic headphone represented an evolutionary improvement upon the original AB-1266 that first appeared in 2013. In fact my conclusion was that the AB‑1266 Phi edition took “an already superb headphone design and made it markedly better,” specifically through a new driver that offered more linear frequency response, more natural and neutral tonal balance, improved sensitivity, and a substantial across-the-board increase of overall resolution and focus. The improvements that came with the Phi edition seemed so significant that I really did not expect that Abyss would revise it further still—at least not any time soon. But I was wrong. This past June, Abyss announced its new AB-1266 Phi CC edition headphone, which brings even more changes. While the CC model retains the Phi edition’s enhanced driver, it has shifted away from the traditional black anodized finish of the AB‑1266’s headband frame, ear cups, and ear cup covers, instead using a new, baked-on ceramic coating (hence the ‘CC’ moniker). Company president Joe Skubinski advised that the ceramic coating is tougher and offers better colour consistency than the previous anodized finish, which is why the change was made. The ceramic coating also offers different damping characteristics than the anodized finish, which might potentially contribute a small improvement to sound quality. However, one Phi CC edition change that yields a much larger sonic change is the all-new Phi CC edition ear pad. Relative to Abyss’ original AB-1266 pads, the new pads differ in depth, bevel angle, the size of the driver opening, interior volume, padding materials, and outer coverings (a new perforated leather material). Some readers might think ear pads would have minimal impact on headphone sound quality, but in my experience the opposite is true. If that last statement seems far-fetched, consider this: if headphones were loudspeakers, then their ear pads would effectively serve as both the loudspeaker enclosures and as the ‘room’ in which the speakers are played. Viewed in this light, you can see why ear pads would play a huge role. The new Phi CC edition pads take the sound of the AB‑1266 Phi headphone to a noticeably higher level. With the new pads, the headphone delivers greater perceived resolution and nuance, improved rendering of spatial cues (and hence greater perceived three-dimensionality), and a noticeably more open and free-flowing sound. 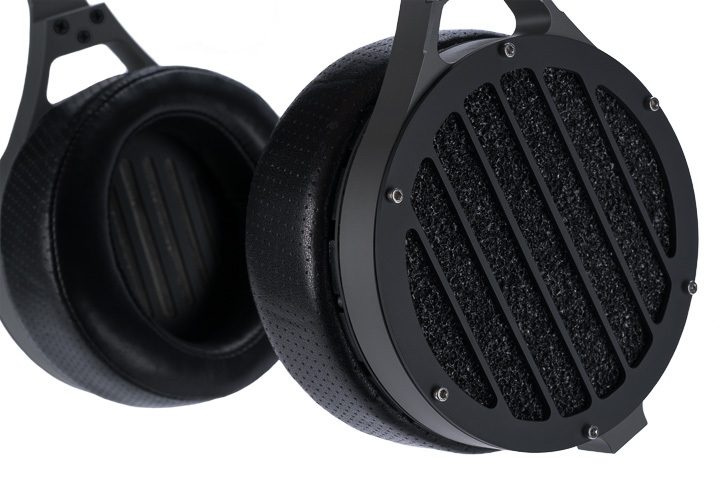 The new pads and the improvements they bring come as standard on AB-1266 Phi CC edition headphones, but also will be offered as upgrades for earlier generation AB-1266 models. To appreciate what the Phi CC headphone does so well, try listening to a well-made live recording such as the track ‘Anabasis’ from Dead Can Dance’s In Concert[PIAS America, 16/44.1] and note the adept way in which the headphone handles textural, transient, and spatial details in the music. ‘Anabasis’ features a recurrent, very low frequency percussion motif juxtaposed against a shimmering and also recurrent treble percussion figure. The Phi CC edition headphones beautifully capture the weight, depth, and incisive attack of the low-pitched drum being struck, while simultaneously rendering all the delicate, finely filigreed textures and harmonics of the high percussion instruments. Perhaps best of all, though, the headphone conveys the myriad low-level spatial cues (including subtle crowd noises and stage/hall reverberations) that together give this track the uncannily realistic sound and ‘feel’ of a live concert event. It’s this engaging and engrossing quality of vivid realism that sets the AB-1266 Phi CC edition apart from competitors. If you can make peace with the AB-1266 Phi CC edition’s admittedly unorthodox inverted “U”-shaped frame (trust us; it’s much more comfortable than it looks), this is a world-class headphone whose sound quality places it near the top of any list of state-of-the-art contenders. I encourage listeners to hear the Phi CC’s for themselves, but be forewarned that hearing could lead to buying.